On Friday, the president signed into law the greatest legislative accomplishment of his administration, and the most significant tax reform in the past three decades, the Tax Cuts and Jobs Act of 2017. It was a narrow legislative victory in both houses. In the Senate, the margin was 51 to 48, entirely along partisan lines. On this vote, Senate Majority Leader Mitch McConnell (R-KY) delivered for the president. But in the case of the Alabama Senate election, McConnell was working against the president and the Trump agenda. So, when the Senate convenes in January, the narrow 52 to 48 Republican advantage will be an even narrower 51 to 49 margin, and the 49th vote that Senate Majority Leader Chuck Schumer (D-NY) will now be able to rely upon will be the far left Democrat McConnell helped elect over conservative Republican and Trump agenda supporting Roy Moore, the now Senator-elect Doug Jones (D-AL). Let’s break down how this happened, and what it portends for the political future in 2018. What President Trump fails to note is that Mitch McConnell’s establishment ally Strange lost the Alabama Republican primary to Moore after the president endorsed him. To his credit, President Trump announced his support for Moore in the general election immediately after his primary victory in September, and did not abandon that support, despite the debunked allegations of sexual harassment incidents from more than 30 years ago that first surfaced in the Washington Post on November 9. McConnell, in contrast, used these allegations as an excuse to abandon the legitimately elected nominee of the Republican Party for the December 12 special election. And his establishment allies, including Alabama’s most prominent former Democrat, Sen. Richard Shelby (R-AL), helped elect a radical Democrat to a seat in a state President Trump won by 28 points in 2016, by publicly encouraging Republicans not to vote for Moore, the party’s nominee. Shelby’s betrayal was particularly damaging, coming as it did before a wide audience on CNN’s State of the Union just two days before Alabama voters went to the polls. His announcement that “I couldn’t vote for Roy Moore” gave Alabama Republicans permission to do the impermissible–vote for a radical Democrat over a conservative Republican. The president forgot to add this key qualifier to that true statement, however–in cases they contested. A key difference between those five successful Republican Congressional races this year and the unsuccessful Republican Senate campaign of Roy Moore in Alabama is that the vast majority of the Republican establishment did nothing to aid the party’s nominee in Alabama, and in fact actively worked against his campaign. One of those five Congressional victories–the special election in Georgia’s Sixth Congressional District on June 20–was nationalized in the same way the Alabama Senate special election on December 12 was. Huge donations poured in to support the far left Democratic candidate, 30-year-old documentary film maker Jon Ossoff, from wealthy liberal enclaves in New York City, Los Angeles, San Francisco, and Washington, D.C. SuperPACS received six and seven figure donations from left leaning billionaires. All told, more than $30 million–almost all of it raised outside Georgia–was spent in an effort to elect Ossoff. The Republican candidate in that race–a reliably Trump supporting establishment friendly Karen Handel–received a great deal of support–around $20 million— directly in her campaign, and indirectly through aligned SuperPACS. It was not nearly as much as Ossoff had, but in the end it was sufficient. Handel, the Republican candidate, defeated Ossoff, the Democratic candidate, by five points on June 20, 52 percent to 47 percent. Had Roy Moore received a comparable level of support from the Republican establishment in the Alabama Senate special election, he would have won, and by a decent margin. 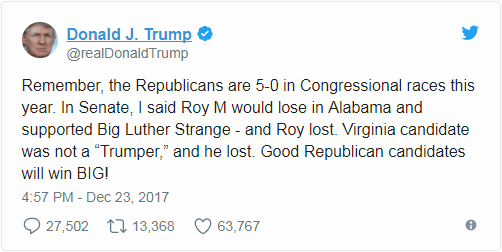 President Trump is quite right that Ed Gillespie, the Republican candidate for governor in Virginia who was defeated by the Democratic candidate, Ralph Northam, was not a ‘Trumper.” But he lost despite significant support from the Republican establishment, while Roy Moore, who was definitely a “Trumper,” lost because he was a flawed candidate and the Republican establishment actively opposed him. Finally, the president turns to political prognostication for 2018. What has to happen for that prediction to ring true, and for the Republican Party to maintain control of the House of Representatives and expand its 51-49 margin in the Senate? Good Republican candidates who support the Trump agenda must be fielded, as a starting point. But more significantly, they must be provided–every one of them who wins the Republican nomination for his or her race–with sufficient financial and people resources to win. 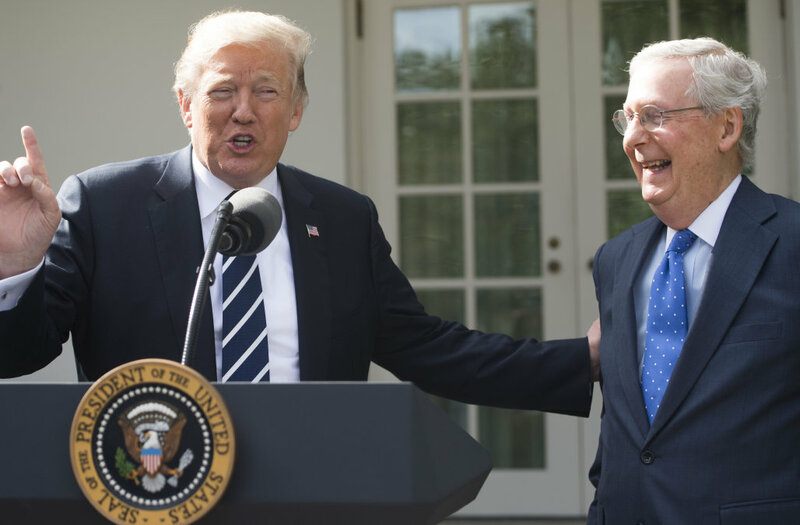 If Mitch McConnell and his allies give Republican nominees who they feel will be loyal to the Trump agenda and not to the Republican establishment the same level of support they gave Roy Moore, it will be a very bad outcome in November 2018 for the Republican party, President Trump, and the Trump agenda. The immediate consequence of the Doug Jones victory in Alabama–enabled as it was by McConnell and his establishment allies–is to energize the far left base of activists to get out the vote, and to encourage wealthy liberal Democrats who live in their coastal elite enclaves to keep sending buckets and buckets of cash to turn elections in traditionally Republican areas their way. If the Democrats take control of the House of Representatives, everyone in the world knows that their first agenda item will be to impeach President Trump. If that comes to pass, perhaps President Trump will send out a tweet thanking Senator McConnell for making it all possible as the Democrat leadership transmits the documents of impeachment requiring the U.S. Senate to conduct a trial to decide whether the president will be convicted and removed from office, or found not guilty and allowed to finish out his term. Please. Moore is another Russian Stooge. You people should be ashamed of yourself. You are losing whatever small credibility you had. He did an interview where he spoke in Russian when questioned if he would say something to Putin.